That’s right. I said flan. Which I have no business making. But the boy’s been bugging me about it for about a year, and I actually had a recipe from a friend’s mom, and well, what the hell else was I doing this gloomy Sept. Saturday? Rather, I tried to make flan. I was actually afraid it might turn out, which meant I wouldn’t get much of a blog post out of the experience. Yes, things were going that well for a while. Combine all of this together. Utter a little prayer to the cholesterol gods while you’re at it. Heat 1 cup of sugar in a skillet. Pour this into your dish. Add the milk mixture. Refrigerate for AT LEAST two to three hours. Run a knife or spatula around the rim and flip onto a platter. Voila! (or maybe I should say, Mira!) Flan! Except for my flan wasn’t cooked through. I kept it in the oven for at least an hour and 20 minutes. Maybe I should have kept it in longer. Or maybe the culprit was my bain marie? But the outsides of my flan looked pretty set. It was the middle that was still jiggling. Well, maybe it would set in the fridge. I let the thing rest, having learned my lesson about resting food after a few disasters with lasagna. Then I put it in the fridge and forgot about it. Oh, and I realized I’d forgotten to add the vanilla. So maybe it wouldn’t be as sweet as some other flan. Alas. When I pulled it out hours later, the middle still had not set. I tasted it. Eggy, true. But not bad. But not a flan, either. I couldn’t even flip it upside down on a platter to see how my brulee on the top came out. Luke commented on how it might be good drizzled over a nice berry tart, and I agree. But that would mean I would have to make berry tarts, and I just don’t have the energy after spending the afternoon making a flan disaster. Marisa, whose mom gave me this recipe so long ago, thought that maybe I should just say I made egg custard, and leave it at that. It’s a ruse I’ve tried before. But I can’t leave it at that. I want to try this again, but maybe I need a different bain marie setup. Or maybe I just need to bake it longer. Maybe the vanilla is what makes it set. Who knows? I’m balking at having to buy more eggs and condensed milk, though. Maybe, my mom and I will stop by and we can make one together. I can show you how to make tamales too. 🙂 The nits can help! All is not lost – run it thru the blender with a little (who am I kidding – a lot of) rum, some nutmeg and/or you’ve got yourself an egg nog frappe! So, I just started reading your blog and I might have missed this but, have you checked the temperature on your oven? Like, put in a good oven thermometer and made sure it’s giving you the proper temp? That can affect a LOT of things, including a flan setting. I also pour in the super-hot water once I have the double pan already sitting on the oven rack. It’s easier than trying to move the bain marie. If you get any water in the custard, it won’t set. Hope this helps! 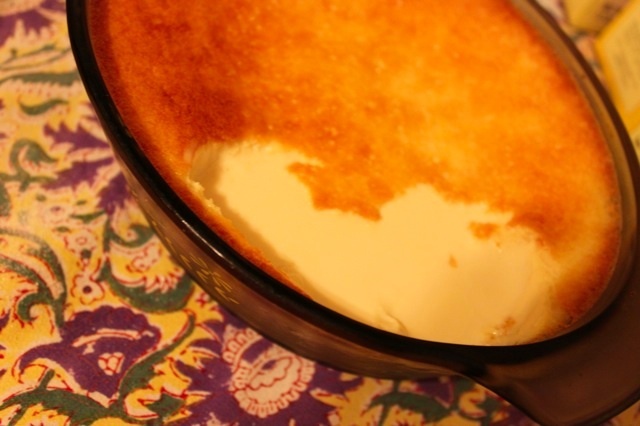 Hmm, first, you do not use regular milk on the flan recipe, ever. 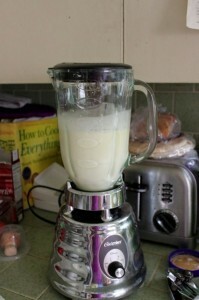 Now, if you want to make a vanilla flavor flan, you dont use cheese. 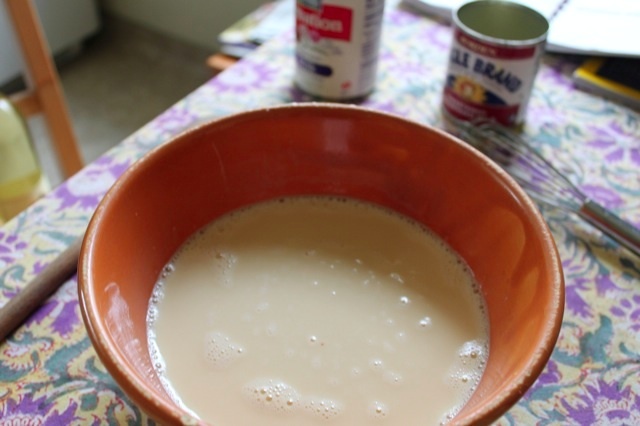 You just need: 1 of condensed milk, 2 of evaporated milk, vanilla to taste (I dont measure it), 6 or more eggs (the more, the larger and firmer it will be), no salt ever, and of course, make the caramel. Bake at 350 for hour and half, keep refrigerated for 3 or more hours. 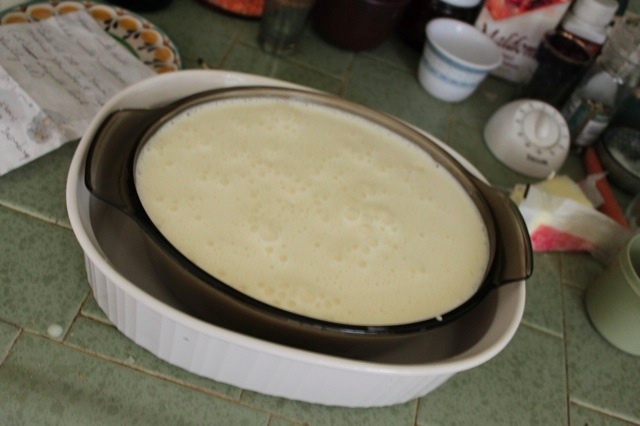 Now, if you want to make a cheese flavor flan, you will need the cheese, but as Ive never tried it, I dont recall how which or many of the milk (evaporated or condensed). Rest of ingredients keep the same. Good luck! Next post: Breakfast Cupcakes: Chocolate Zucchini!